I’ve just bought a plot of land over near Capri (De Oude Weg), and intend to build a house on it. One of the things I’d like to do is install an underwater heating system (hydronic heating) for the house. I almost installed one in my apartment in Shanghai a few years ago, and regret not doing it, especially when I visited friends who had done it! 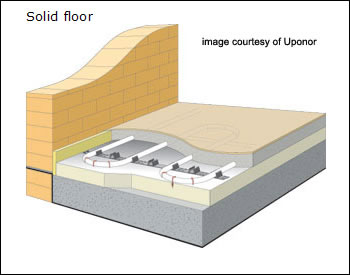 Underfloor heating has literally been around for thousands of years, so its not a new option. As the romans and greeks noted, heating is best situated at the ground level, as heat rises, and the area’s that we live in will stay warm. So, thats what I intend to implement. While I don’t even have foundations in place, or even architect’s plans, let alone any council bits done, I have already been looking at getting the underfloor bits ready, so I can order and ship a container over. Priorities! Underfloor heating is best planned and implemented before/during a house build, so now is the perfect time for it from my perspective. Underfloor heating essentially means running piping in a loop under the flooring. The piping comes back to a central location to a manifold, and hot water (or cold water if you want to cool a house, eg in summer) is piped through the manifold to each room. NB – Its better to run parallel loops to increase heat efficiency, rather than a long in / out loop. 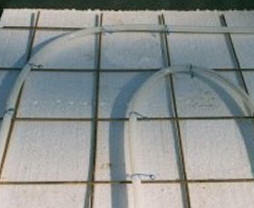 This piping can be laid directly into the foundation slab, or on top of it, usually with insulation above the slab. There are pro’s and con’s to both methods. With the piping in the foundation, the concrete gets heated, and keeps its heat for a long period. The concrete holds the heat and gives it out much like a stone holds the heat in the sun. with a 50mm overlay concrete with insulation between the overlay and the slab (insulation above the slab). Repair or replacement of the pipes is easier. With the pipes in the slab replacement is pretty much impossible. The floor temperature can be easier adjusted to changing conditions and less heat loss. Other services can be accommodated in the floor. Interestingly its important to insulate the sides of the floor also, more heat escapes that way than up, as heat escapes to where the resistance is least. This can be mitigated somewhat by laying the piping away from the exterior walls. I’m probably going to use ICF (Insulated Concrete Formwork) for the outer foundation walls, with a concrete mix of 20 mpa, 100 slump, 13mm aggregate for the foundation and walls. This is where the walls have an inner and outer styrofoam layer and the concrete is poured inside. It provides great insulation and sound proofing, and speeds up build, plus its greener. Win/win! I’ll then lay the pipe in the foundation or above a insulation layer above the foundation (as per the diagram above) in a parallel loop using PEX conduit routed to a central location. Each room will have a different pipe conduit (probably using 100M lengths) back to the central location (aka maintenance closet), this will allow me to use 20cm spacing (works out to roughly 5M of pipe per M2 of room). I’ll update more when I have shopped more! This entry was posted in Solar Heating and tagged hydronic, underfloor heating on July 15, 2014 by lawrence.